I'm a creamy peanut butter gal all the way! I don't think I'll ever change that, either. I think it's too funny that you just purchase two containers of pb - that's what I would do, too. Also I like that you don't stick to grape. I prefer apple jelly, so it's nice to see some originality. Team crunchy! And Sam, you avoid tearing the bread by spreading a little butter first. Duh. I am definitely a crunchy peanut butter lover but have to buy the reduced fat to assuage my conscience for eating the fat and sugar. This is one of the few areas where Grandpa Harley and I DON'T have to compromise in our food consumption. I wish I could help but I'm allergic. If I wasn't, I'd pick crunchy. Team Creamy for sure! My kids wont touch the crunch stuff!! I'm all about crunchy! It's a texture thing for me too, but for whatever reason I only have creamy in my house right now! Creamy all the way for me, but my husband will always be a crunchy fan! We're opposites! Ryan is team crunchy all the way and I'm team creamy. Althoughhhh.. I don't hate crunchy, I just prefer creamy. He actually loathes creamy so he's a little more extreme than me. This is so funny to me! Oh, the creamier the better! I like the whipped pb especially. Unlike most people, however, I hate jelly on my sandwiches; it's a texture thing. Just gross. Creamy! Crunchy makes me gag. Also, I will always drink 2% milk. No compromising for me! Haha! I think this is a point of tension in every marriage! I love creamy. My husband eats crunchy. So we buy both! We buy two jars here too. 3 eat creamy and 1 eats crunchy. Honey roasted creamy Peter Pan! I don't like peanuts. Never have and never will. But I love peanut butter! So team creamy for me! Creamy all the way! But you get major props for having your PB&J sandwich with strawberry jelly! That's my favorite! Don't hate me but...creamy. Nick and I both like creamy. If I wanted crunchy bits of peanuts, I'd just eat a handful of peanuts! I like my sandwich smooth!! 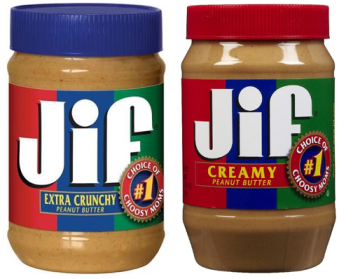 However, I think I'm in the minority because I am just PB sandwich girl, hold the J. haha. Team Creamy! I always bite the crunchy pb and hurt myself. But yeah, the texture thing. Sorry! We have the same debate in our house! I love crunchy and Tom is a creamy fan. I can't stand the texture of the creamy, so the nut parcels break that up for me in the crunchy. We have the same debate in our household. John prefers creamy while I prefer crunchy. I have just given in and allowed him to buy creamy, but I really would like to buy crunchy one of these days. Lol! We are the same! I'm a crunchy gal. My husband hates the stuff. He is creamy all the way!